Simply the most stunning, moving images of how music can change the world – this is the power of music. In the face of adversity and in the toughest of circumstances, music can lift the human spirit and bring people together like no other force on the planet. 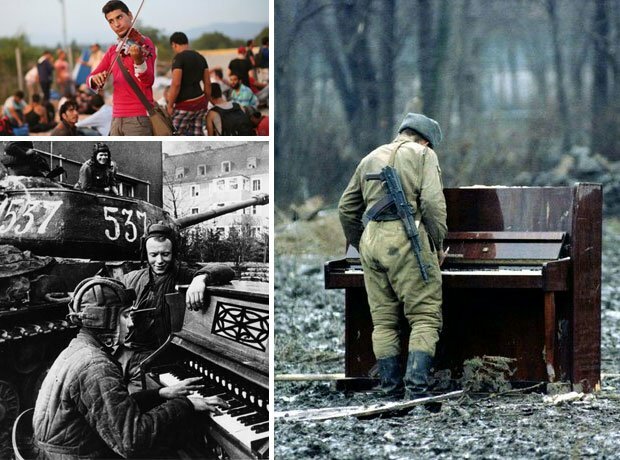 Soviet tank crew in 1945, a soldier in Chechnya in 1994, and a Syrian migrant in 2015: all caught up in conflicts - and all moved, no matter how briefly, by music. Explore our gallery of similar moments from the last 100 years. Karim Wasfi, former director for the Iraqi National Symphony Orchestra, plays his cello next to debris from a bomb in Baghdad's Adhamiya district in May 2015, in a symbolic act of protest against violence. Musicians perform La Marseillaise, the national anthem of France, in Times Square, New York on 21 July 2016 in tribute to victims of the Nice Bastille Day tragedy. The Baltimore Symphony stage an impromptu concert outside their home venue in an effort to promote peace and ease tension after rioting in April 2015. The pianist, photographed by Facebook user Anastasiia Bereza, reportedly set up his piano in front of the armed police the day after protesters in Kiev brought down a statue of Lenin. "The world sends us garbage... we send back music" say the young people in the poverty-stricken landfill town of Cateura, Paraguay. Forging musical instruments from rubbish, many children forced to work in the landfills have been brought together by classical music in an ensemble known as the Recycled Orchestra.